South Carolina Sen. Jim DeMint is under attack -- from liberals! (Liberals, in this case, means "Republicans who criticize DeMint for pushing candidates too crazy to win Senate elections.") Tony Perkins' Family Research Council calls on you to come to his defense. With prayer. Given the seemingly incessant scandal, ethical wavering, and lack of moral backbone in Washington today, it's no surprise that politicians are generally not held in high esteem. What is surprising is that politicians are not held up nearly enough in prayer. Whereas the Bible instructs us that "supplications, prayers, intercessions, and giving of thanks, [should] be made for all men; For kings, and for all that are in authority," (1 Timothy 2:1-2), I pledge to pray for America's elected officials at least once per week. And by "elected officials" they mean solely DeMint, because everyone else -- so-called Republicans included! -- is a filthy abortionist liberal. 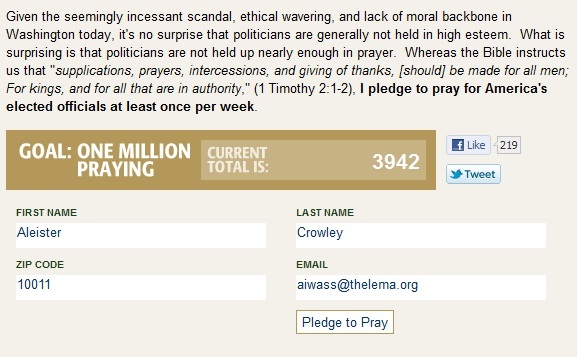 The FRC's goal is 1 million praying for DeMint, and they're currently at 4,500 and counting. Because I'm a firm believer in public service, I signed up myself. I'm praying for ya, Senator! Hopefully this will protect you from intra-party squabbling, and lightning.